Serifos is a really beautiful, sundrenched island in the Aegean sea, just south of Kythnos, and about 55 nautical miles from Pireaus. There is plenty of water underneath, floming down from the mountainous terrain, and it even has a fresh water lake, near the port, Livadi. 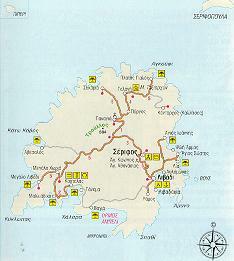 Arriving by sea (there is no airport), ferry boats take about 4.5 hours from Piraeus or about 2.5 hours by Hydrofoil. 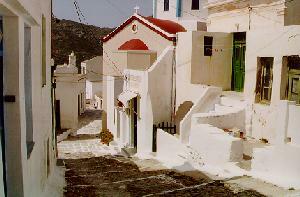 Serifos is composed of a port (Livadi), the main town (Hora) and scattered villages. The southern part gets the best weather as it is shaded by the cold northern winds by the mountain on the island. Hora, the main town on the island has no vehicular roads, and all the movement of people is generally undertaken by donkeys (yes even today). This did not stop many invaders of taking advantage of the island which was under Venetian rule in the early 1800s. This is evident by the many houses with Venetian logos on them, especially "Arhontika" houses, the houses which were owned by the Clansmen (Arhontes) of years gone by. Such houses overlooked the entire island, and were normally kept by those with money, ie by those who owned land. 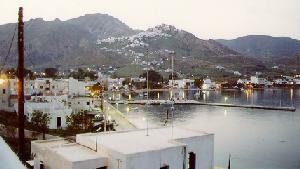 This is the port of Serifos. It is about 5 kilometers outside the main hora, whih can be reached either on a car or bus, or by climbing a "Kalderimi," a stone path which is well marked. It has a nice big beach and many hotels and rooms for rent and great restaurants (Stamatis, on the right side of the bay was our favorite and is the least expensive). There is port police here, travel agencies, bars and many restaurants offering fresh fish and other topical delicacies. 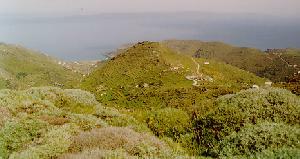 Although Livadi is a nice village and practically the main town in the island, it is a good vista point to see South of the island towards the next island, Sifnos. KOUTALAS Nice village with a beautiful bay and lovely beach, secluded from the winds. It is also the site of the old mine delivery cranes, rusted remnants of which are found on the left side. Access is onloy via a gravel road from Livadi, past the cemetery. A nice, but northerly village catering (as with most Kyklades islands) to the needs of windsurfers. Late in August, when the Meltemi winds pick up, this is the place of choice for windsurfing. Dont miss it! 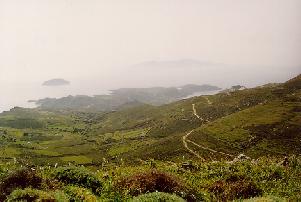 From Sykamia one can look North towards the Kythnos islands. 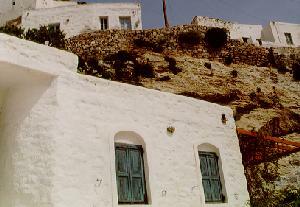 This is a wonderfully located monastery, situated in the North West of the island. It was build in the beginning of the 17th century and saw much riches in its time, often plundered by pirates. It has 60 cells and are made available to pilgrims. 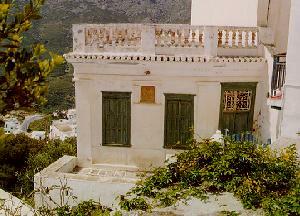 To view stereo pictures of Serifos, click here! There are no hotels here. There are no hotels here, just a good restaurant. CORALI, 0281/51500, 150 places includes bungalows, tents spaces etc.